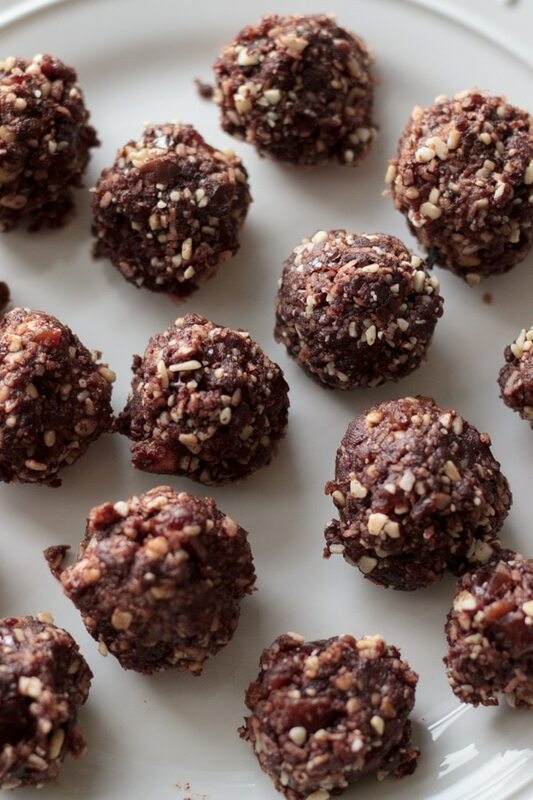 Almond joy energy bites – perfect bite sized healthy snacks to beat that chocolate craving! Vegan & gluten-free treats ready in less than 10 minutes. I’ve been hearing a lot about dates recently. Not the dinner and a movie kind. The fruit kind. I was a little skeptical about adding dates to my dessert, but I did it anyway. I’m not really sure why I’m typing one line paragraphs. To build suspense? Is it working? If I’m being completely honest, I probably should re-take these pictures. These pictures are from the first time I made them, and you can see that there are still little chunks of almond and dates that are not completely mixed. Sure, it adds a certain grunge vibe. Am I using that word right? Like not totally put together? Because they’re not. Because what really happened is that the dates I added almost broke my food processor. If there is one thing you remember from this post, PLEASE let it be to remove ALL pits from dates before doing anything with them. That should get its own paragraph. Remove pits from dates. And double check that they are in fact, missing the pits. So that you don’t break your food processor. And end up with grungy energy bites. Besides that tiny setback, these little things are pretty darn delicious. Remaking them may end in a prettier, more “put-together” appearance, but it has no impact on their taste. And wouldn’t you know – they are also vegan and gluten-free! Just for the record, given a choice between Almond Joy and Mounds, I would always pick a Mounds bar. As a kid I remember picking out that big almond right in the middle of an Almond Joy and throwing it away. As a “grown-up” I have developed a certain appreciation for almonds, and they are kind of important here to hold everything together. If you don’t kill your food processor before finishing, the almonds will eventually make a sort of almond butter that will make it stick. I’ve been wanting to hop on the energy bites bandwagon for a while now, and I have a feeling I’ll be making more versions of these in the future. Just please, someone remind me about the pits! Since your pictures will likely be much prettier than mine, please share them with me if you make this by using #trialandeater on instagram! I’d love to see your creations. 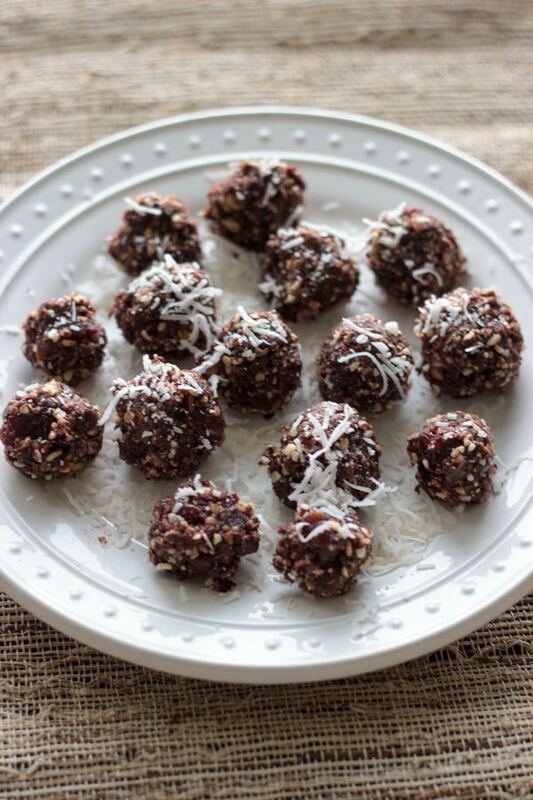 Almond joy energy bites - perfect bite sized healthy snacks to beat that chocolate craving! 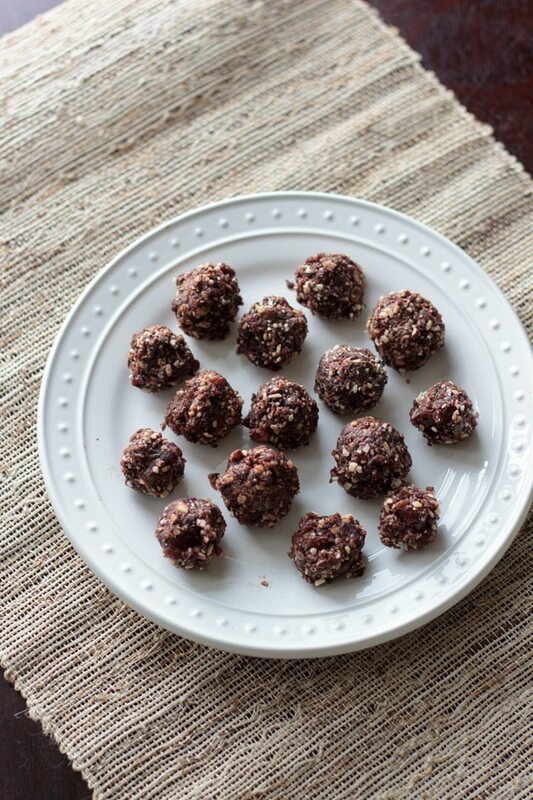 Vegan, gluten-free, no-bake raw treats. Make sure the pits have been removed from the dates! Add all ingredients into food processor. Blend for 2-3 minutes until combined and the mixture forms a dough-like consistency. Form dough into balls and roll in extra coconut flakes if desired. Serve immediately or put in fridge. Can store in refrigerator in an air-tight container for up to a week. Let me know how you like them, Vanessa! What a fun and delicious treat! Like you, I’ve been a bit skeptical of dates. I mean, there are so many other delicious fruits out there…and then these dates are looking at you. I say if dates stepped up their appearance game, more people might pick them up. Seriously though…these energy bites sound awesome! Oh, I love love love dates! These bites sound amazing! I am always torn between almond joy and mounds because I like the almonds but I prefer the dark chocolate on mounds… they need to make dark almond joys!! I haven’t had dates in such a long time! I feel like they get categorized with prunes as being well…not the most appetizing dried fruit! But they’re so sweet and delicious! This looks like a great healthy energy bite! Yes I think you’re right about the prunes! But at least when you chop up the dates they still taste pretty darn good! Dates can be really hard on a food processor even without the pits! They just about did my mini processor in. These energy bites sound so good! I didn’t like almond joys as a child but now I love them. It’s funny how our taste buds change as we get older! I’ve now made the carrot and almond joy versions. I personally love the almond joy ones better, but that’s just me. Everyone in my family loves these and I love the clean ingredients. Only thing I changed was adding some protein powder and slightly more coconut oil. Thank you! What is the size of your food processor? I can’t imagine all of this fitting in mine. Perhaps I’ll try to blend with my immersion blender. Also, Have you tried substituting non-sweetened coconut? You could always cut the recipe in half or process the ingredients in batches if you have a small (less than 5 cup) processor. I don’t think an immersion blender would work with dates. 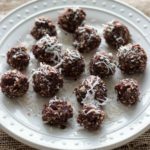 I’ve not tried with unsweetened coconut but the dates may provide enough sweetness for this to work! I don’t think you can say there is no added sugar when the recipe calls for sweetened coconut. That’s fair – I didn’t realize the mistake! I’ve taken that out.